of the highest quality cutting and grinding equipment. The Centro-Metalcut product line is founded on innovation. We carry our history of innovation forward as we constantly enhance, improve, and invent new ways to help your company produce more product in less time. We will custom engineer our equipment to fit your application. By combining the latest technologies with rugged reliability and longevity, you are assured to receive an end product that surpasses any expected level of quality. 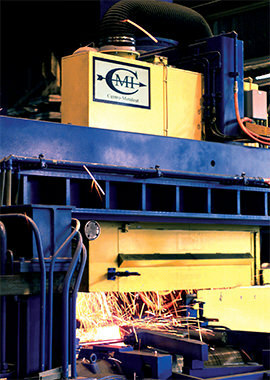 Unlike many other companies in our industry, we design, build, and test our machines at our plant. This feature reduces installation and startup time. This saves you downtime at your end, and saves you money. In addition, our equipment can be installed in-line to reduce the time and costs associated with off-line systems.